About us - PIPESTAR INTERNATIONAL INC.
Pipestar International Inc. was established by 3 entrepreneurs with over sixty years of combined experience in the High Density Polyethylene Pipe (HDPE) industry. The manufacturing of ARC™ seamless HDPE Bends began in North America in 2002. The original impetus for developing a seamless long radius HDPE Bend came from the mining sector. Mining companies were looking for a fitting that would stand up to the harsh operating conditions created by their slurry lines. Seamless High Density Polyethylene Bends with smooth interiors was the answer. ARC™ seamless HDPE Bends proved to be not only longer lasting than traditional fittings (including tradition HDPE mitred fittings) but their smooth interiors meant that head losses were minimized. 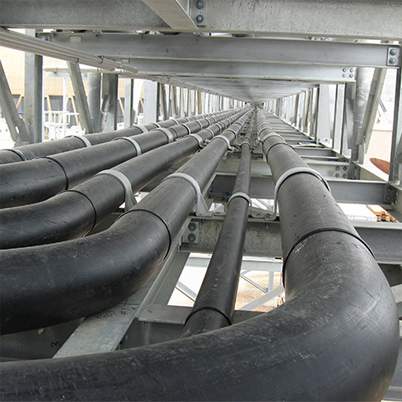 Initially Pipestar International’s ARC BENDS™ range was from 2” to 14”. In 2013 Pipestar introduced their “Super ARC” sizing which increased their product range to include, 16”, 18”, and 20” sizes. Pipestar’s production facility and distribution centre is centrally located in Winnipeg, Manitoba, Canada. This location allows easy access to all markets in North America on major trucking routes. Pipestar International Inc. manufactures and stocks standard 90, 60, 45, and 30 degree elbows throughout their product range and will manufacture any size angle as a special order. Pipestar International Inc. sells through a network of stocking & non-stocking distributors throughout Canada and the USA. Please click here for a distributor near you.